The organization was incorporated in 1938 as the Woodrow Wilson Birthplace Foundation. 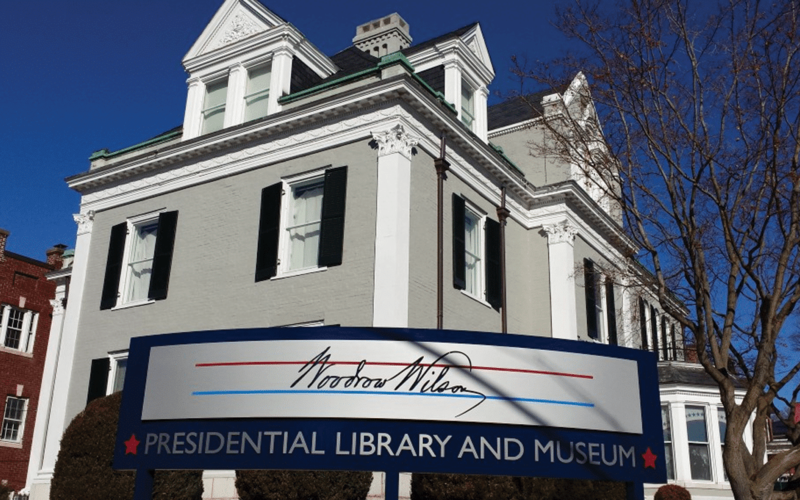 The name was changed in 2004 to the Woodrow Wilson Presidential Library, but the mission remains to preserve Woodrow Wilson’s Birthplace – the Staunton Presbyterian Manse – and to serve the ideals that Wilson supported through his public service. Founding Trustees included a number of important figures in the Wilson Administration and a core group of civic-minded Virginians. The preservation of Wilson’s Birthplace had the ongoing support and active involvement of the President’s widow, Edith Bolling Galt Wilson, originally from Wytheville. In 1964, the Manse was designated a registered National Historic Landmark. Research in the 1970s led to further restoration and refurnishing to the year of Wilson’s birth (1856), and the Manse now represents the early-to mid-Victorian era. Research on the exterior masonry’s finish resulted in removal of 113 years of white paint from the masonry surface. To more accurately interpret the house as it appeared in 1856, the exterior was returned to its red appearance. The Manse is located within a federal historic district in Staunton known as Gospel Hill. Over the years, the Foundation acquired additional properties adjacent to the Manse, and in 1990 opened the Woodrow Wilson Museum with exhibit galleries interpreting the life and public service of the 28th President. This building, named the Dolores Lescure Center after a long-time Board Chair, also houses the educational center on the second floor, curatorial offices and collections on the third floor of this building, and a World War I Trench exhibit in the basement. The Lescure Center also features President Wilson’s 1919 Pierce-Arrow limousine. The Garden Club of Virginia, which installed and expanded the gardens behind the Manse and around the Museum, continues to maintain the gardens. Foundation offices are located in the building next to the Manse, named the Emily Smith House after another long-time Board Chair. The President’s Shop, which serves as the admissions center and gift shop, is also located in the Emily Smith House. In 2008, the Foundation acquired the historic Kenwood house next to the Lescure Center on East Beverley Street. This site houses the Library and Research Center on the second floor and the Don W. Wilson Hall meeting space on the first floor.